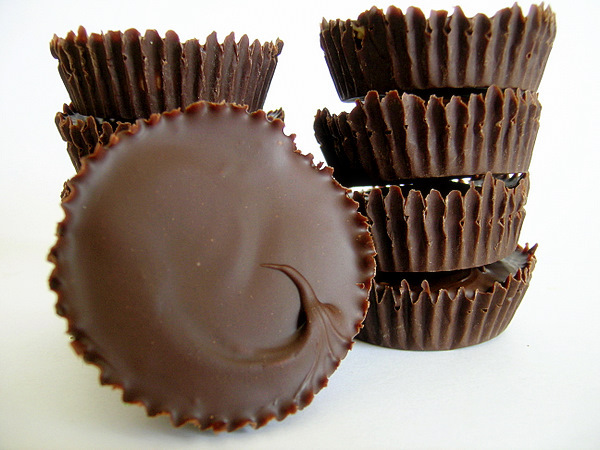 I’ve always wanted to make my own chocolate and peanut butter cups. The recipes are so easy, I’m not sure why I’ve never gotten around to it until now. They really took no time at all, in nearly 30 minutes I was already sinking my teeth into these oh-so-rich peanut butter cups. I looked at a few recipes and skipped on most of them. Some of them used shortening, or called for ingredients I didn’t have. I used the recipe from Have Cake, Will Travel; they looked like the perfect ones. My notes: I took the advice from Have Cake, Will Travel and added 2 tablespoons of peanut butter to the melted chocolate; I did not add extra salt; I melted the chocolate in a heavy-bottom saucepan rather than the microwave; I used regular sized cupcake liners, not minis, so mine are closer to Reese’s Peanut Butter Cups size; I used the freezer instead of the refrigerator to set up the chocolate on the bottom. They are so delicious. They are better and richer than Reese’s Peanut Butter Cups. Keep these stored in the refrigerator; they melt quickly. Due to the continued popularity of this post, I am going to finally post the recipe here instead of only linking to it! If you want to make these vegan, click through to the original recipe from Have Cake, Will Travel – link is below. If you want to make these mini, try adapting the recipe for a mini cupcake tin (I think I’ll do this the next time I make these). If you like this recipe, be sure to check out my “gourmet” salted chocolate peanut butter cups, using Lindt’s sea salt chocolate bar! Prepare a standard muffin tin with 12 paper liners. Combine chocolate, peanut butter and salt in a heavy-based saucepan over very low heat, or use a double-boiler, to melt the chocolate. Stir frequently. Remove from heat. Place 2 teaspoons melted chocolate in each cupcake liner and carefully spread it with the back of a spoon at the bottom and only ¼ of the way up the liner. Repeat with all 12 liners. Place the chocolate-covered liners onto a plate in the fridge to firm up, for about 20 minutes. Meanwhile, prepare the filling: Stir together peanut butter, sugar, optional crumbs, and salt. The chocolate should be hard by now, so divide peanut butter paste into all 12 liners, about 1 heaping tablespoon (20g) per liner, pressing down gently to make sure the paste goes everywhere. Place in fridge to firm up, for about 20 minutes. Top with 2 teaspoons melted chocolate, spreading carefully so that none of the peanut butter can be seen. Let cups firm up in fridge for at least one hour before enjoying. Store in fridge or freezer. 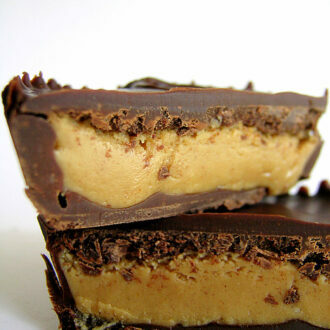 Those look decadent and amazing – my brother in law would kill for homemade reeses – thanks! I gotta go see if I have PB in the house. I need one now! Too brilliant! How did you keep from eating them all? Little Miss Cupcake, they are awesome! Surprisingly, I still have 3 left. It’s so hard to not them all at once, it’s taken some amazing self-control! Oh. My. Goodness. These look incredible. I can’t wait to try them! My kind of treat! YUM! Oh my gawd, if I had these in the house, I’d be in SERIOUS trouble! Who could stop at one??! I tried these this afternoon , I don’t particularily like the peanut butter filling , It’s not grainy , I enjoy the graininess of reeses – I might try them with regular white sugar instead of icing sugar and see how they are . Thanks for sharing the recipe ! WOW!!! I just made these to give as gifts for valentine’s day and of course had to taste test one to make sure they turned out! Oh my goodness, they are amazing. thanks for the suggestion!!! Mine had the graininess of reeses. It happened by mistake, kind of. I didn’t have enough peanut butter (only half what the recipe calls for), but I had crunchy cashew butter which I used for the other half. Awesome! That’s really neat about the cashew butter, I bet that helped with the amazing-ness factor, I love cashews! These look amazing! What kind of chocolate did you use? The picture of the peanut butter cups on the Have Cake, Will Travel site look a little darker. Hm… I can’t quite remember which one, but I’m pretty sure it would either have been Nestle or Ghirardelli semisweet chocolate chips. this is the same question I was going to ask! glad I read the comments! Have a wonderfully sweet evening! Wow!! These look amazing! My mom loves reeses- i will definatly make these for her birthday!! “They melt quickly.” I bet they get eaten quickly, too. These are great. It’s hard to eat only one. I used Trader Joe’s 72% dark chocolate, and sweetened the peanut butter with honey. I made them “open face” without choc. on top because I didn’t have enough chocolate on hand, and they were fine. Thanks ! Those look amazing. 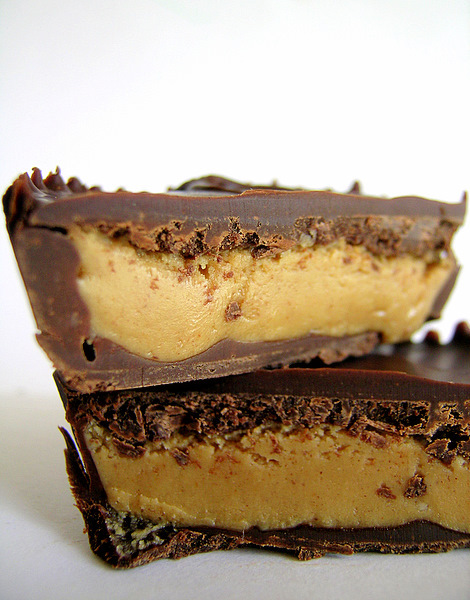 Peanut butter and chocolate is one of those combos that just can not be beat. around easter, i use the huge choclate bunnies that my kids get, melt them down for my choclate. my mom did this for years when i was younger. crunchy peanut butter is good, also ii’ve used choclate grahm grackers instead of regular honey ones. WOW. These look AMAZING. 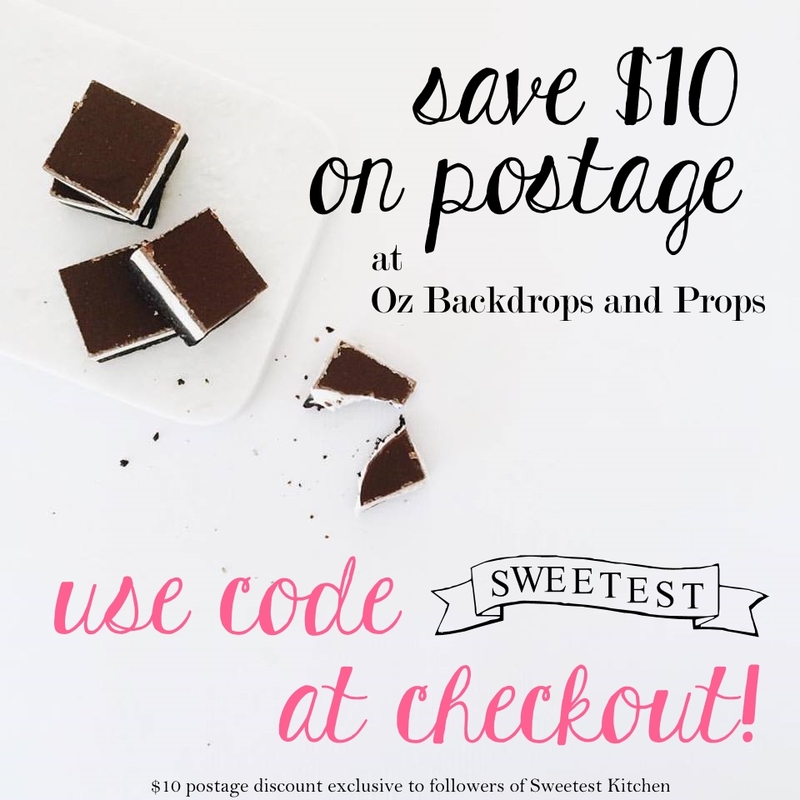 I’m a peanut butter cup fanatic so it would be dangerous to have these in my house – but I’ll probably do it anyway!!! I made these last night and HOLY COW are these good. I did “double” the chocolate in the recipe (same amounts used for bottoms and for topping the peanut butter). Not sure if I did something wrong or this was what the recipe called for. I had extra chocolate at the end of the lining the cup cake liners and knew I would not have enough to top them. I was exact in my measurements too with the teaspoons. I did use the graham cracker/conf sugar and it turned out GREAT. I used this recipe but made it into one giant cup (using a giant cupcake mould) and it was incredible! My housemates loved it! Ok, just made this and a bit bummed! Here is what I would change. Get rid of the graham cracker bits if you are using natural peanut butter. Way too weird texture. Need way less than 2tsp of chocolate on the bottom…you really only need barely enough to cover. For the center you don’t want to spread it all out otherwise it ends up more like a sandwich looking cookie than a peanut butter cup. Make a little ball and press it in the middle but DONT let it go out to the edges. THEN pour the chocolate over the top being sure it goes on the sides. Should work a bit better I think. The flavors are good but too overpowering on the chocolate. Hi there, I’m not sure if they freeze well or not – we’ve never kept a batch long enough to find out! I would imagine that they would freeze okay. These are incredible! I used milk chocolate chips and sprinkled sea salt on top of the finished cups…one of my roommates commented that they were better than Reese’s! I’ve tried another recipe without brown sugar in the PB mixture, but this one is much better.